A few readers may have heard of the Reverend Andy Cain. Rev. Cain is the vicar at St Mary's church on The Avenue in the Cuddington quadrant of Worcester Park (That's the bit west of the railway line in Epsom and Ewell) and is an active member of the local community. He was recently elected vice chair of the Worcester Park Residents' Association (which I now chair) and want's to use his resources to reach out to all parts of the local community and bring everyone together as part of a single community - an admirable vision. As part of this, his church, St Mary's is running a Community Harvest Appeal in aid of the refugee crisis. “I am impressed by the generosity of spirit exhibited by the good people of Worcester Park, thank you. For the past few years we have been using our Harvest Appeal as a way of giving much needed food to local people who do not have enough. These appeals have principally been through the local FoodBank, although other charities such as Crisis have also rightly benefited. 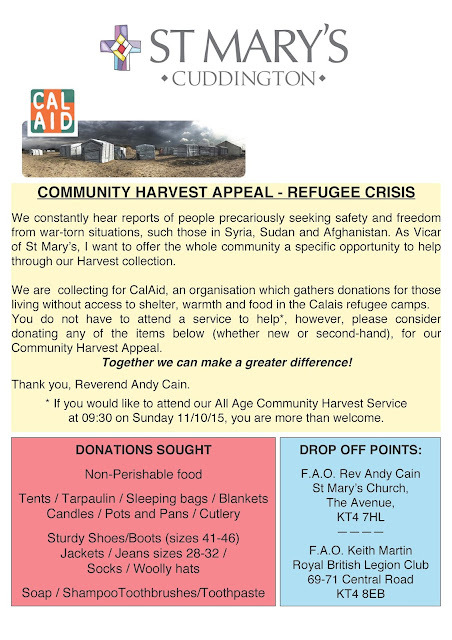 This year, in light of the migration issue seen in our media, it is appropriate to demonstrate our good nature to people who are struggling outside of our area, I realise that the political situation is complex, but with this in mind, we are organising a Community Harvest Collection in aid of the refugee crisis. Many stores in Worcester Park are displaying the attached letter, if you are able to give anything of benefit, whether small or large, please make use of the two allocated drop off areas (St Mary’s Church and the Royal British Legion). Once again, thank you for your help and generosity. Together we can make a greater difference. While putting this post together I am finding myself thinking of things I have around the house that I could easily donate and not even miss. I'm sure if we all did even that bare minimum, together we would make a huge difference. The harvest service is on Sunday 11th October so we have 9 days to get those donations in!